By the time I left for Baku I'd been living full time on the boat for close to nine months, and I'm pleased to report that I'm finding it a much more pleasant, normal, comfortable existence than I expected. Yes, there are some compromises, but they seem almost invisible to me now. Human beings are remarkably adaptable, though, so recently I've begun to wonder whether my boat life really is as normal as I think it is, or whether a hundred small compromises have blended together into what now seems normal but is objectively actually kinda weird. And being aware that there seems to be a certain appetite for blog posts about the boat (Steve G, I'm looking at you... Are you still out there?) I thought I'd examine this theory in more detail, using a couple of specific examples. I often say that boat life makes you very aware of everything you consume. This is because every resource on the boat is finite, including some intangible ones. For instance: As soon as you moor in a new place the clock is ticking - you can only stay for a maximum of two weeks. Mooring time is finite. So is the amount of water in the water tank, the amount of diesel to run the engine, the amount of electricity in the batteries, the amount of coal and kindling for heating, the amount of propane for cooking and hot water, the amount of empty space in the toilet tank, and the amount of Internet data each month. Everything you do is a small trade off and those trade offs, while mostly invisible or untroubling, are a constant part of boat life. The happiest of boat days is when I've successfully moved to a nice new mooring with no engine-related mishaps along the way, having filled the water tank, emptied the toilets tank, disposed of all garbage and recycling, and landed somewhere with a strong mobile phone signal. Bliss. 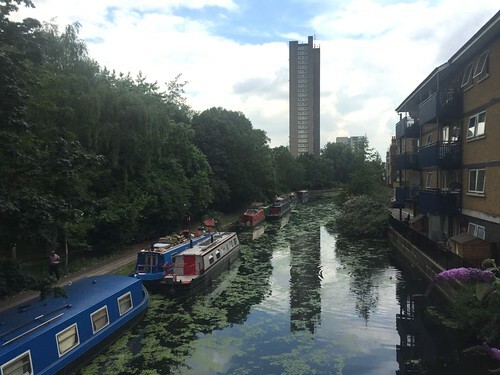 One of my favourite moorings, near Westbourne Park. It's central, close to transport and groceries and cafés with free wifi, but still leafy and pleasant. On the less weird end of the spectrum, I am always very conscious of the battery level on the boat. Like, VERY conscious. 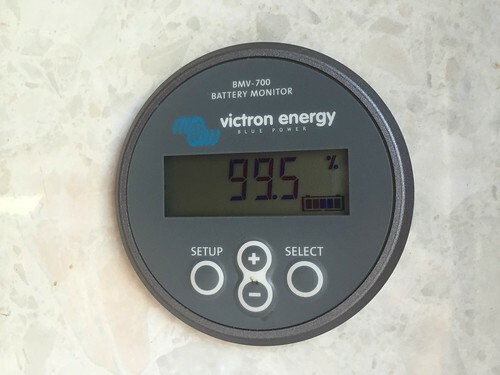 I even bought a fancy digital battery meter that tells me to within 0.1% the battery charge level. And it tells me exactly how much current is flowing in or out. And the wattage, and the number of amp-hours left at the current consumption rate. Love that meter. Things that consume a lot of power include the water heater, water pump and shower drain pump (but they all run very intermittently, so they're no biggie). The inverter that turns my 12 volt battery power into 240 volt mains power is a bigger hog, especially when I charge my computer, and of course the big culprit is the hair dryer. So I outsource stuff when I can. For instance, the computer and iPad often get charged in cafes or other mains-powered places when possible. Or when that's not possible they get charged when the sun is shining or the engine is running. Hair drying is not outsource-able. Damn. When I dry my hair I tend to stand right next to the battery meter and do it in stages. Dry a bit. Let the battery recover a bit. Dry a bit. And so on. And I simply don't have some things that are big power hogs. I have a hand-cranked coffee grinder instead of electric. And I don't have a microwave (though that's more about not having the space). I do miss having a toaster, though. And there are times when a little electric heater would be really nice. Internet access can also be a concern. I have one of those wireless thingies that spits out wifi, but it's limited to 20GB each month. If I run out, an extra 5GB is £15. None if this is the end of the world, but it does mean that I don't do any big downloading or streaming on board. For instance, if I'm posting photos to Flickr for the blog, I'll do it at a cafe or other public wifi spot. But what about Netlfix? How do I watch "Stranger Things" Not having that ability would be the kind of thing that made boat life feel like a real compromise and not a proper normal 21st century existence. Here's where it gets more clever. My phone plan includes unlimited data (for £20/month! Eat your hearts out Canadian readers!) This means that, with the help of an exorbitantly priced and annoyingly fragile Apple video adapter, I can plug my phone into the TV and watch on the big screen. Usually this works just fine, though if the mobile signal where I'm moored is a bit weak it can be frustrating. That's when I turn to stuff previously downloaded onto another device. All in all, it works just fine. And when it doesn't work, I can always read a book, right? Boat life weirdness gets a bit more pronounced when considering water use. 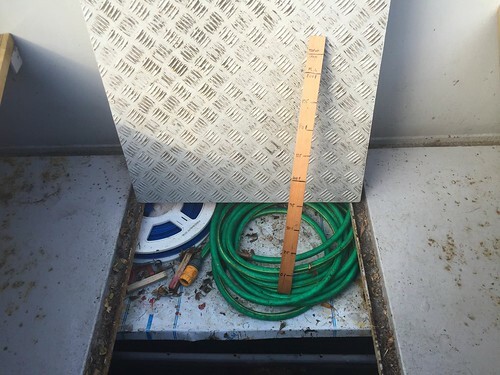 One of the things I was concerned about when I moved on board full time was the size of the water tank. That tank supplies all fresh water on the boat for cooking, washing up, laundry and showers and holds about 200 litres. (I use two litre bottles of water for drinking, which, happily, also double as ballast in the boat. Multi-tasking is an important concept on the boat. Also, occasionally a slug gets into the water tank, so you don't want to be drinking that stuff.) Two hundred litres is not a lot of water. And running out of water is a show-stopping event. Even if I was happily ensconced in the best mooring spot in London, if I ran out of water I'd have to decamp to fill the tank, hence probably losing the mooring. Go Stay Work Play Live's crack fact-checking team (AKA "Google") have conducted extensive research and determined that the average one-person household in the UK uses, on the low end of the scale, about 45 cubic metres of water annually. That's 123 litres DAILY. Now that I live with a keen appreciation for water conservation, I find that figure staggering. If I used that much water every day I'd have to fill up every 38 hours. Obviously that's ridiculous, but equally obviously, I was right to be concerned. However, fret not, dear readers. I'm not sure how those figures are calculated (maybe they slipped a decimal point?) because I'm happy to report that I have found it's not difficult to make 200 litres of water last two weeks. And yes, I am showering. How do I do it? Well, one of the biggest water hogs is eliminated right away - I've got a chemical toilet so there's no fresh water being flushed down the loo. (Eventually I hope to have a composting toilet, but for now the chemical is more than adequate.) Beyond that, the big water consumers are showering and laundry. When I can, I do laundry at laundrettes, because that means I don't have to festoon the boat with drying laundry for a day. Even so, in a normal two-week cycle, doing one load of laundry is fine. Where the laundry system falls down is with items that need ironing. Even with my mostly-not-working casual boat lifestyle, there are still some things that just need it. Luckily, I've realised that local dry cleaners will wash and iron shirts for a few quid each, and that's been working well. Yes, there's a small cost, but that's #boatlife. 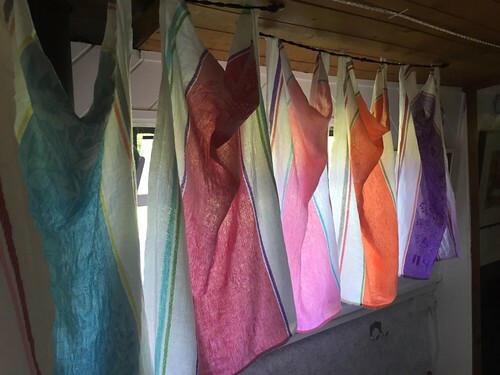 Picturesque backlit tea towels. Note the ingenious bungee cord clothesline system. No clothespins required! Here's the water tank, which sits under the bow deck. That's the deck hatch/lid leaning against the boat. And the lid of the tank itself is slid open a tiny bit to insert the gauge, which is clearly reading 100 litres. As for washing up (that's dish washing for Astute North American Go Stay Work Play Readers), I have a few strategies there as well. For instance, I never fill the sink full of hot soapy water. Usually I only have a few dishes to do, so I'll heat a bit of water in the kettle and fill a small container in the sink - something like a plastic tupperware tub or a small saucepan. Soap goes in there, and I dunk a washing sponge in, wash each dish, and set it aside in the sink. Then I turn the tap on at a low volume and rinse and stack the dishes in the rack. Easy peasy. Note that I said I heat water in the kettle. (Which is heated on the stove of course - certainly not electric!) This is because firing up the water heater comes with that long period of time where you run water through the system while it heats up. No way! It's a more efficient use of water (and possibly gas as well) to simply warm up the kettle a bit. It doesn't even have to be boiling. On the more extreme/weird end, I often boil an egg in the shell for breakfast, meaning I end up with a small saucepan of boiling water after the egg is removed. On those mornings the lid goes back on that pot to conserve the heat and when breakfast is done that water gets a squirt of soap and does double-duty for washing up. This is one of those things that makes me wonder if I've tipped over the edge from clever to weird. Is this simply smart use of resources? Or has boat life blinded me to the fact that I've become a water-hoarding freak? Comments welcome below. 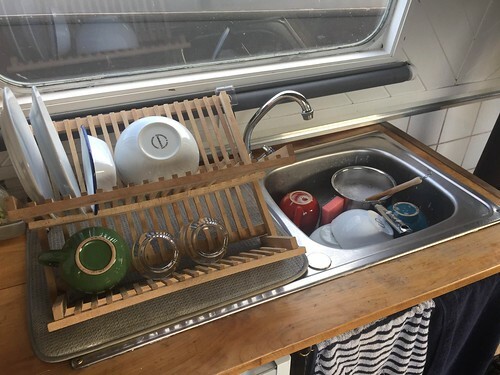 Here's the washing up system. Including saucepan in the sink with soapy egg water. "A shower? Yeah no problem at all. Just a couple things... I have to turn on the inverter, so the water heater has power. That just takes about thirty seconds to kick in. Fine. It's fine now. Now you want to turn on the hot water full blast. Just the hot. Full blast. Because the hot water heater requires a high volume of water to turn on. You'll hear it kick in. It makes a faint "fwoomp" noise. There! Did you hear that? No? Well it was there. See? It's warming up. But if it doesn't kick in you can turn on the hot tap on the bathroom sink as well, which increases the water flow and then when it fwoomps you just turn the sink off and it'll all go to the shower. And then it will get really really hot, so you can add cold water, but not too much because then the flow to the water heater will go down too much and it'll stop and you'll have to fwoomp it again. Ok? Good. Also just make sure the circuit for the shower drain pump is on before starting. So anyway, I normally soap up and then turn the water off to scrub. Then while it's off you can turn on the drain pump. Just feel outside the shower on the wall there's this little switch. Turn that on. You'll hear the pump working. Then when the sound changes from a sort of pumping noise to a sort of sucking noise you can turn it off. You'll be able to tell. No really, it's totally obvious. Then you can turn the water on again and fwoomp it and rinse off. But keep it quick, OK? And then when you're drying off run the pump again. And that's it. Oh, except remember to turn the inverter off when you're done. Unless you want to dry your hair. Which is no problem at all. Just a couple things about drying your hair..."
I've realised that there's actually a lot more I can say about life on the boat, so I'll continue to parcel it out as and when the mood strikes. In the meantime I'm back in Baku which is weird, but also weirdly normal. For instance, the power in the wall never stops. And the water flows out of the taps forever. Again, weird but also weirdly normal. But not long after I arrived and got into my hotel room, I realised that even though it's bigger and more comfortable and someone comes and brings me clean towels when I want... I still miss my little boat. 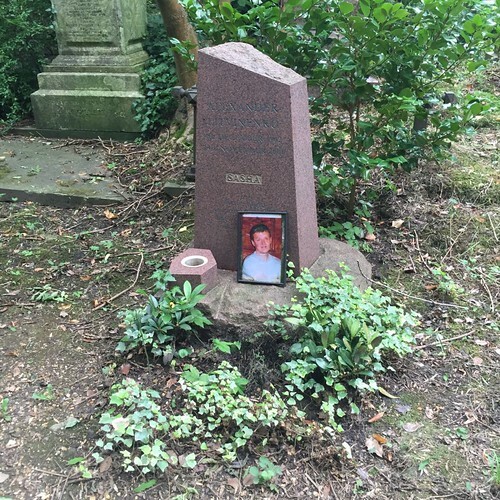 A visit to north London’s Highgate Cemetery has been on my list for a long time. We’ve touched on the topic of cemeteries in London before. I was sure I’d also blogged about a good book on the subject (“Necropolis: London and its Dead”) but apparently I dreamed that, somewhere in between the dream where Bill Byrson emails to say he’s been lurking on the blog for years and invites me up to his place in Yorkshire for a pint and a friendly ramble across the countryside and the dream where Harrison Ford comes and builds new kitchen cabinets for the boat. But I digress. 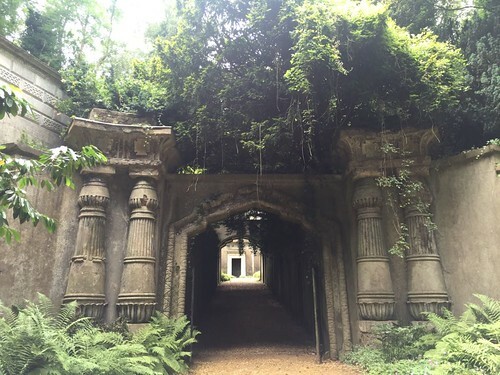 Back to Highgate Cemetery, which I visited a while back after managing to secure one of the limited number of tickets they issue for guided tours each week. I seem to be blogging about the Victorians a lot these days - Crossness and Bazelgette, the ropemaking, Brunel’s boat and bridge - but honestly, they were a pretty interesting and clever bunch and I like reading and writing about the interesting and clever things they did, so settle in. Astute Go Stay Work Play Readers will recall that for most of London’s existence the dead were buried in small local churchyards, often one on top of another to pack more and more corpses into the finite space available. By the mid-1800s though, this practise was becoming unsustainable and, frankly, pretty gross, what with the stench of rotting corpses oozing up out of the ground, along with the occasional stray arm or foot. 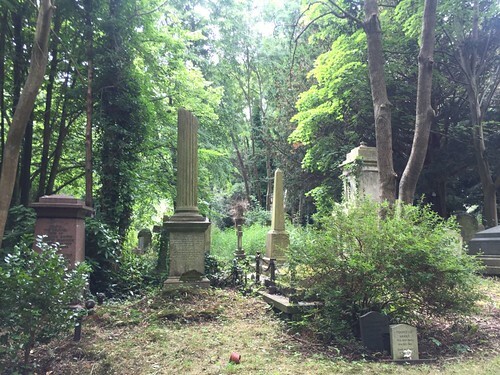 In 1832 parliament passed an act encouraging the establishment of large privately run suburban cemeteries outside the metropolis of London and eventually seven were created under the auspices of the London Cemetery Company, with Highgate Cemetery opening in 1839. Shortly after, in 1851, the new Burials Act prohibited fresh burials inside London, thus firmly establishing the “Magnificent Seven” as going concerns. 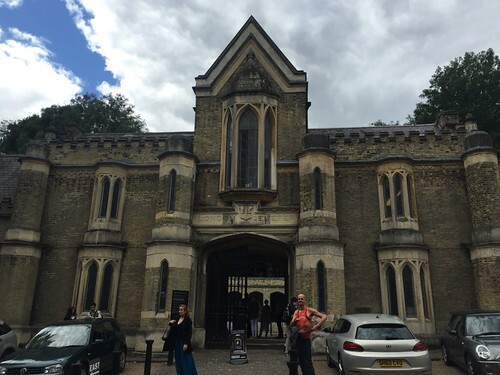 Here’s the main entry to Highgate Cemetery, with the chapel on the left side. Highgate Cemetery is divided into west and east sides. The west was established first, on 17 acres of land below Highgate village, most of which is on a steep hillside with sweeping views south towards central London. Its grounds were laid out with exotic formal plantings and stunning gothic architecture in order to attract wealthy investors. The Victorian attitude towards death was different than our own. As with their buildings and bridges, graveyards and grave markers became a way to show wealth and status, especially with elaborate headstones, crypts and tombs. The prices for plots in prestigious areas of Highgate were not cheap, and with lots of space to fill and an ever-renewing clientele, Highgate grew quickly. More than 10,000 graves had already been created in the original west side when the cemetery it extended across the road to another large swathe of land in 1854. 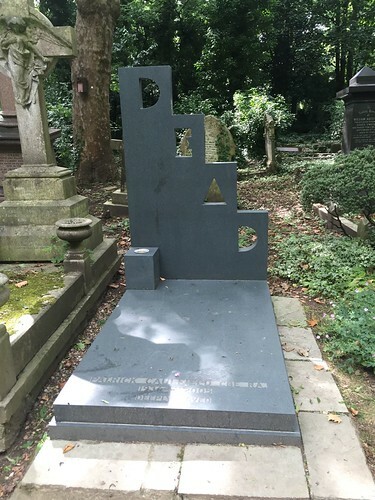 The east side is home to Highgate's more modern graves. 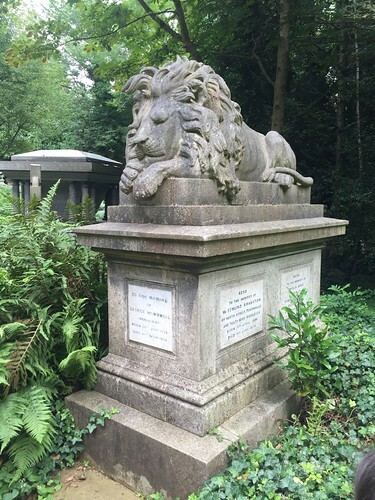 This is Nero the lion, at the grave of George Wombwell, shoemaker-turned-menagerist. Despite what you're probably thinking, this one isn’t actually broken. It was a fashion at the time to depict columns broken off, symbolic of a life cut short. All this Victorian grandeur is part of what makes Highgate a beautiful place to visit today. It’s known most particularly for the architectural features laid out by the site’s designers. 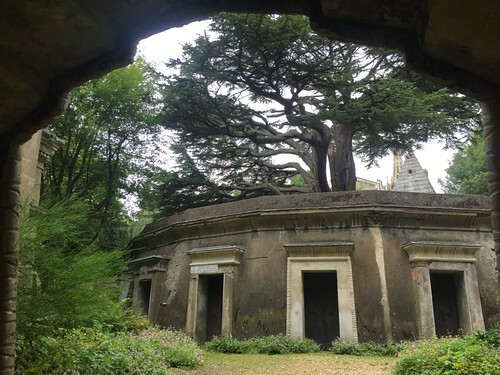 The Victorians had a particular fascination with ancient Egypt, and Highgate’s designers played to those fashions and worked cleverly with the existing steep slope to create the cemetery’s most notable architectural features. "This avenue then lead to the Circle of Lebanon which was built in the same style and consisted of twenty vaults on the inner circle with a further sixteen added in the 1870s, built in the Classical style." The Circle was created by excavating around a 300 year old Cedar of Lebanon tree that already existed on the site. You might think that things look a bit rough and overgrown in these photos, and you would be correct. It’s true that running a large cemetery in Victorian England was - initially - a great money spinner. Highgate's grounds were originally open and manicured, with the aforementioned sweeping views. However, Astute Go Stay Work Play Readers will realise that the business plan behind large cemeteries is fatally flawed. (Ironic.) The difficulty is this: plots are generally sold in perpetuity (their occupants almost never decide to relocate) meaning that once a plot is sold it can never be resold. However, this means that the number of plots available to sell grows smaller and smaller, thus income shrinks. Meanwhile the cost to maintain existing plots, grounds and structures increases, especially as the structures age and decay. Therefore, sources of new revenue eventually dry up as the cemetery is filled, but the expenses grow, leading to financial decline. Add to this the fact that attitudes towards death and practises surrounding it changed greatly after the First World War, with elaborate crypts and tombs falling out of favour, and smaller graves and markers becoming more common. Plots became more and more neglected as families broke up or moved away, and maintenance on those plots declined. In 1960, the great London Cemetery Company - first formed in 1836 - declared bankruptcy and Highgate Cemetery’s gates were closed and the site abandoned. For fifteen years the cemetery was neglected, becoming a vast, overgrown and tumbledown labyrinth. This was unfortunate, but it’s part of what makes the site so beautiful now - the air of stillness and wildness. 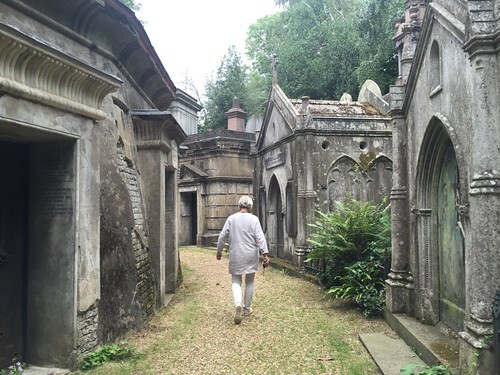 Finally, in 1975, a group of local residents formed the Friends of Highgate Cemetery and slowly began a decades long, and still ongoing, process of clearing the overgrown landscape and pathways and repairing some of the more significant and beautiful memorials. The work is slow, and funded mostly by donations, tour fees and the small revenue stream created by new burials. 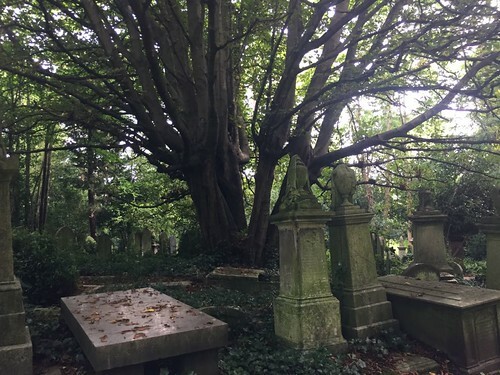 (It’s still possible to be buried at Highgate, even on the west side, though a spot in a prime location now sells for about £10,000.) Part of the ongoing difficulty of managing the cemetery is that the original plots were not intended for single burials but rather as family plots, with enough space for 12 bodies (two wide, six deep). The same is true for the crypts in Egyptian Avenue and the Circle of Lebanon; the vast majority of the graves are underused, with many crypts almost empty and the registered owners long gone, leaving no legal means of opening and making use of much of the available space in the cemetery. Alexander Litvinenko. One of the most recent and notable graves in the west side. The west side of Highgate, with its Victorian grandeur and overgrown Gothic monuments, is closed to the general public expect on the aforementioned guided tours. (Family members wishing to visit gravesites are accommodated privately in the morning.) The general closure is in order to preserve the monuments themselves, many of which are fragile and unstable, and also to preserve gormless members of the public who would be certain to injure themselves in stupid (though possibly amusing) ways while clambering, unchaperoned, over crumbling stonework. Happily, the east side of the cemetery is open to the public every day, and though it's more modern and less evocative that the west side, it does have a few notable residents. 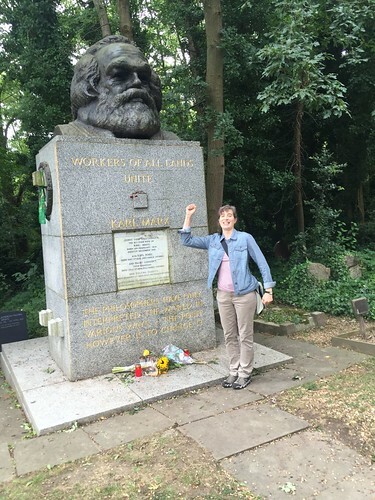 Me and Karl Marx. I'm saluting the workers of the world, obviously. I love this one. Modern artist Patrick Caulfield. 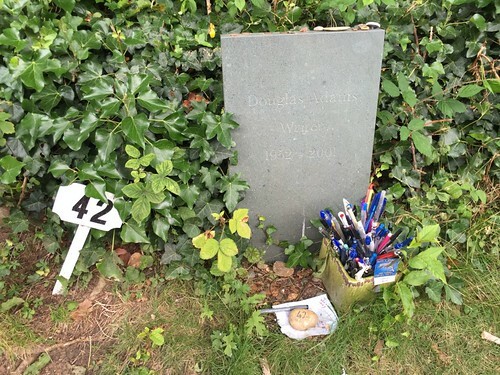 Charmingly, when you stop a cemetery worker to ask directions to a particular gravesite they invariably say something like “Oh, he’s just past the fork in the path on the left.” As if the object of your search is going to be found sitting on a bench having a cup of tea rather than six feet under. And that's Highgate Cemetery. Tick another one off the list for a summer that seems to have included a good crop of bloggable stuff, coupled with a bunch of time off work, an improbable abundance of sunshine, and a respectable amount of cake, which has all been very nice indeed. "Islamic Solidarity Games? Huh?" I know. I know. If you thought my last Baku gig was a bit obscure, you've got another think coming. But they are a real, if intermittent, thing. I've taken to calling them the Islampics, but suspect I should probably stop that. I have no idea if the women will wear full body covering when they're running the 200m hurdles or synchronised swimming or whatever. I'll let you know. But really, is that ALWAYS going to be the first question people ask? And that's it. I'll update on Baku as I get settled, and I'll continue to post London-y, boat-y stuff too, because there are still fun things to report from the summer. Watch this space!